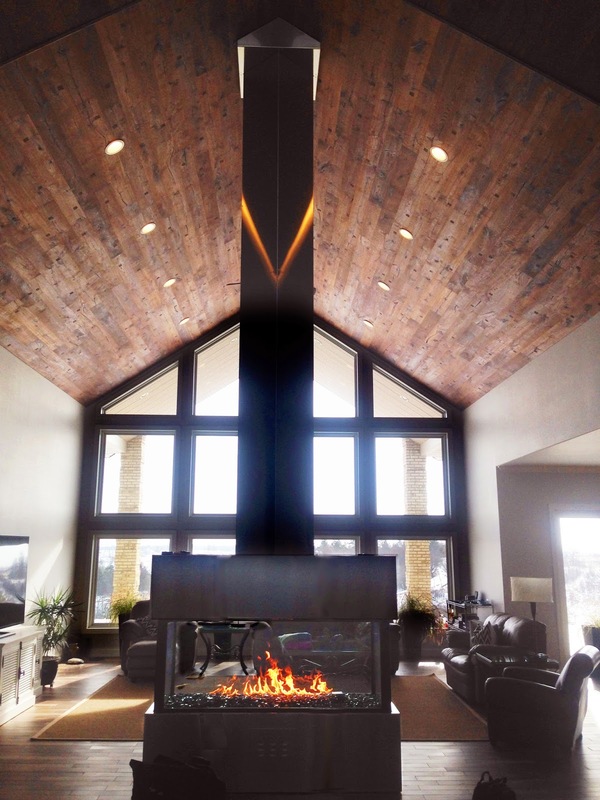 With 25′ ceilings this homeowner wanted a show stopping fireplace that would fit in their modern home in Jamestown, ND. Acucraft built this custom 4-sided propane gas fireplace which was clad in stainless steel by the customer to give it a contemporary aesthetic. A large propane burner providing a big flame. Combustion air had to come from the roof (25′ up) because the fireplace was placed on a cement slab. Needed to output heat to accommodate the cold winter weather in North Dakota. The combustion air intake for this custom propane gas fireplace is located in the roof, brings cold air in from the top, which travels down through four tubes supporting the fireplace and fuels the fire; the gases then travel up and out through the flue. expect from a linear propane burner. All of our gas fireplaces are tested in-house before being shipped to the customer; to ensure the proper flame is achieved and all the safety checkpoints are functioning properly. 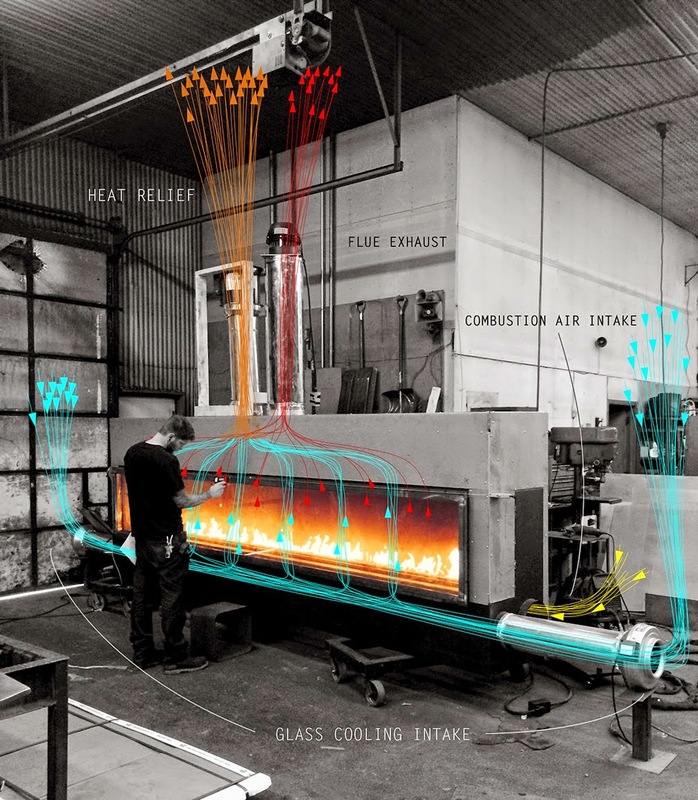 Acucraft carefully tests all of our fireplaces to ensure that both the internal and customer requirements have been met, which includes testing the temperature of the glass. In the image below you can see Brian, one of Acucraft’s welders, testing the glass temperatures using an infrared gun to ensure the temperature does not exceed 113 degrees F.
This fireplace (above) has two air flow systems: Acucraft’s Glass Cooling System and Combustion Air. With Acucraft’s Glass Cooling System there are two intakes on each side of the fireplace pushing air between the panes of glass which significantly reduces the glass temperature, and the heated air is then dispersed within your home or outside through the heat relief. The combustion air system pulls fresh air in through the combustion air intake to fuel the fire and then exits through the flue. The custom gas fireplace above was designed to sit in a concrete base surrounded by seating with a fully suspended hood wrapped in black clad to fit the modern feel of their space. For more details about this fireplace, click here.
" My wife and I purchased our Acucraft Z-Max 5 years ago. We built our 3500 sq ft house ourselves. We installed R-33 in the roof system and R-19 in the walls with 1/2 log siding. We intended for the fireplace to be a supplemental heat source. After our first few fires using the blowers the Max heated our entire house, even with the 26' ceilings! Not only is the fireplace a great heat source, it's also very efficient. We usually have 20 to 30 fires a month with good seasoned hardwood that burn all night. I clean the interior after each burn. There is less than a 2 gal. Bucket full of ashes! Great engineering! "